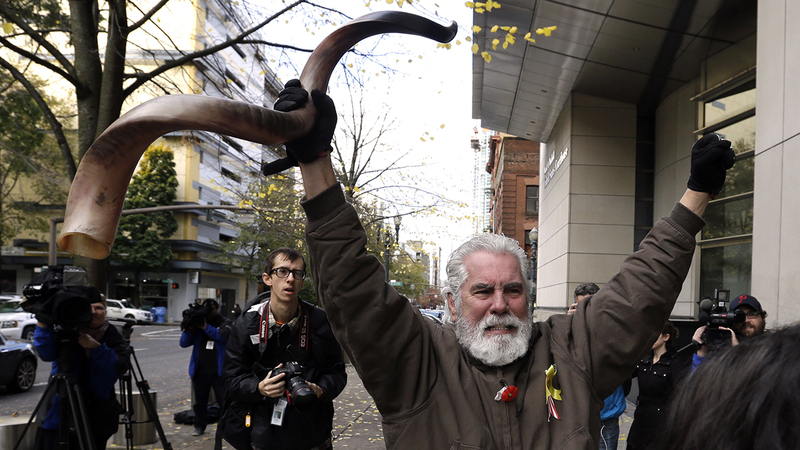 Brand Thornton celebrates after hearing a verdict outside federal court in Portland, Ore.
PORTLAND, OR -- The acquittal of seven people who occupied a federal wildlife sanctuary in Oregon was a rejection of the prosecution's conspiracy case, not an endorsement of the defendants' actions in the armed protest, a juror said Friday, a day after the stunning verdict that government officials feared could embolden other groups. Sympathizers who believe such resistance to the government is justified celebrated the decision, which might invite more confrontations in a long-running dispute over Western lands. Interior Secretary Sally Jewell on Friday urged all government employees to "remain vigilant and report any suspicious activity." In a statement, she said she was "profoundly disappointed" in the verdict. William C. Fisher, an activist from Boise, Idaho, who once camped by a memorial to occupier LaVoy Finicum at the site where he was shot dead by police, predicted that the decision would encourage others to act. "I think a lot more people will be revolting, rebelling and standing up against what we see as a tyrannical government," Fisher said in a telephone interview. The 41-day takeover of the Malheur National Wildlife Refuge last January in remote eastern Oregon was part of a larger debate about the use of federal lands in the West. The militants led by Ammon Bundy, a small business owner from Arizona, wanted to hand the refuge over to local officials, saying the federal government should not have dominion over it. The U.S. government owns nearly half of all land in the West, compared with only 4 percent in the other states, according to the Congressional Overview of Federal Land Ownership. The juror, identified only as Juror No. 4, wrote in an email to The Oregonian/OregonLive that the verdicts were a "statement" about the prosecution's failure to prove a conspiracy charge "and not any form of affirmation of the defense's various beliefs, actions or aspirations." The acquittal of the white occupiers came on the same day that officers in riot gear evicted protesters from private land in the path of the Dakota Access oil pipeline in rural North Dakota. Officers fired bean bags and pepper spray as they surrounded demonstrators, many of them Native Americans who have spent months fighting over tribal rights and the project's environmental effects. At least 117 people were arrested. "Are we going to look at these protests the same way?" asked John Freemuth, a public land policy expert at Boise State University. "I certainly think the tribes will have a point if they find themselves arrested and in jail and these Oregon guys get off." Chris Rasmussen, a defense lawyer in an armed standoff that happened two years ago at Bundy's father's ranch in Nevada, said it is "obvious" that Oregon prosecutors gambled in seeking convictions on felony conspiracy charges instead of lesser trespassing charges. But trespassing is only a misdemeanor, and prosecutors had few options for other serious charges because the defendants never attacked anyone, said Laurie Levenson, a professor at Loyola Law School in Los Angeles and a former federal prosecutor. "This may be a case of no good deed goes unpunished," Levenson said. "The upside of not confronting them was it was less likely there would be violence. The downside was it was less likely that they could use the assault charge." The standoff finally ended when the Bundys and other key figures were arrested in a Jan. 26 traffic stop outside the refuge. That's when Finicum was killed. Most occupiers left after his death, but four holdouts remained until Feb. 11, when they surrendered following lengthy negotiations. Bundy remains in jail because he still faces charges in the standoff at his father Cliven's Nevada ranch. Joel Hansen, Cliven Bundy's attorney, said Friday that he thinks the jury in Oregon "saw through the lies of a government which is trying to prove these Bundy brothers and their compatriots were some kind of terrorists." "There is a seething anger among those who use the land," he said, citing the feelings of ranchers, loggers, miners and Indians. "It's all part of tyrannical oppression. Their goal is to manage them out of business to get them off the land."